Manuscript nautical chart of the Kerguemen Islands, one of the most isolated places on Earth. Port Palliser Kerguelen's Ld. Christmas Harbour Kerguelen's Land. This is a beautiful c.1835 manuscript map depicting Port Palliser and Christmas Harbor on the Kerguelen Islands or Desolation Islands. 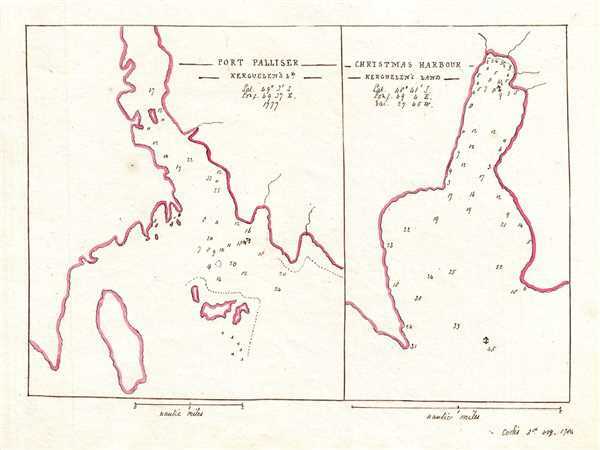 Essentially two maps on a single sheet, the left map features Port Palliser with smaller islands nearby, while the right map depicts Christmas Harbor. Throughout, depth soundings are noted. Latitude and longitude are also noted below each title. According to the text in the bottom right, this map is based on an earlier map from the publication of Cook’s Third Voyage. Officially discovered in 1772, Captain James Cook re-discovered the islands during his third voyage in 1776 when he anchored there on Christmas day, and named to harbor Christmas Harbor. Seeing the sterile landscape Cook named the islands ‘Desolation Island’. The island group continues to be amongst the most isolated places in the World. Very good. Manuscript map. Minor spotting.